Westwood High School Golf Team celebrates and poses with their State Championship Trophy. Back Row: Danny Frodigh, Sean Beggan, Chris Erickson, Will Frodigh, Trevor Fahey and Coach Peter Hochman. Front Row: Matt Mackin, Mark Horsfall, Joey Healey, Tim Hall and Hannah Blonder. The Westwood High varsity golf team finished an impressive regular season with a 16-2 record to win the Tri-Valley League before winning the Division 2 State Championship on Monday in Georgetown. Mark Horsfall pulls out the old “Texas Wedge” and putts a ball towards the cup from off the green. Senior Will Frodigh, junior Matt Mackin and junior Dan Frodigh finished the regular season with the top-three scoring averages in the TVL. 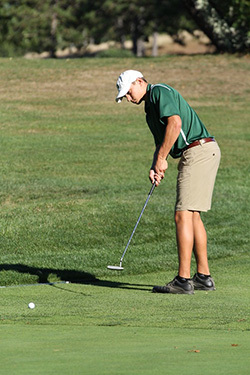 The team also competed in the MIAA South Sectional Championship on October 24 at Easton Country Club. The Wolverines placed second out of 17 teams with a total score of 304. Will Frodigh (73, +2) placed fourth in the tournament for best individual score while Matt Mackin (76, +5), Dan Frodigh (77, +6) and Tim Hall (78, +7) all shot extremely impressive rounds as well. Hannah Blonder, who competed from the men’s tees, and Sean Beggan also represented Westwood on Monday in Easton. Senior Trevor Fahey, juniors Christopher Erickson and Mark Horsfall and freshman Joey Healy brought great spirit and hard work to the team as well. Winning the TVL outright and sailing through the MIAA Division 2 South Sectional Championship at Easton Country Club just wasn’t enough, however, as Westwood clinched the Division 2 State Championship on Monday at Black Swan Country Club in Georgetown in the 13-team state finals match. The Wolverines finished with a total score of 312, edging out runner-up North Andover by two strokes. Westwood was again led by senior captain Will Frodigh, who shot a 74 (+2), tying for second in the tournament for individual score. Junior Matt Mackin shot a 77 (+5) and junior Dan Frodigh shot 78 (+6). Rounding out the scores for Westwood were juniors Tim Hall (83), Sean Beggan (89), and Hannah Blonder (88), who was the only girl competing in the pool of 103 golfers.